The Dow Jones Industrial Average rose nearly 300 points on Monday after the announcement of a trade truce between the U.S. and China. A portion of the U.S. government debt yield curve inverted, raising fears of a weakening economy. "Equities plunged on" Trump's tweet on Tuesday, "highlighting a tough stance on tariffs," Citi equity analysts say. The arrest of Huawei's global chief financial officer Meng Wanzhou on Wednesday was a shock to officials in China. The Dow is now down almost 4 percent this week and has lost more than 1,200 points in two days. The Dow Jones Industrial Average rose nearly 300 points on Monday, the first trading day after President Donald Trump and Chinese President Xi Jinping announced a 90-day cease-fire in the trade war. The truce meant the U.S. and China would hold off on adding more tariffs on each other's goods at the beginning of 2019. A portion of the U.S. government debt yield curve inverted on Monday. The phenomenon, characterized by when short-term rates exceed long-term rates, raises fear of a weakening economy. While the yield of the 3-year Treasury note surpassed its 5-year counterpart on Monday, traders are largely watching for when the 2-year yield surpasses that of the 10-year. Trump declared "I am a Tariff Man" in a tweet Tuesday, threatening to put more duties on China if the trade negotiations fail. "Equities plunged on" Trump's tweet, "highlighting a tough stance on tariffs," Citi equity analysts said in a note to investors titled "Sing us a song, you're the tariff man." His statements gave investors little hope that progress had been made on trade negotiations. The Dow dropped about 800 points on Tuesday in the biggest daily decline since Oct. 10, the last big market rout. Trump's administration backpedaled on automotive tariffs in particular. Automakers have been hit hard by the trade war. Volvo is one of several companies beginning to consider moving auto production and jobs overseas. Trump said Sunday that China "agreed to reduce and remove tariffs on cars coming into China from the U.S." The White House acknowledged Tuesday that there actually was not a deal in place to reduce or remove tariffs on autos. Traders also gave a technical reason for the magnitude of Tuesday's drop. 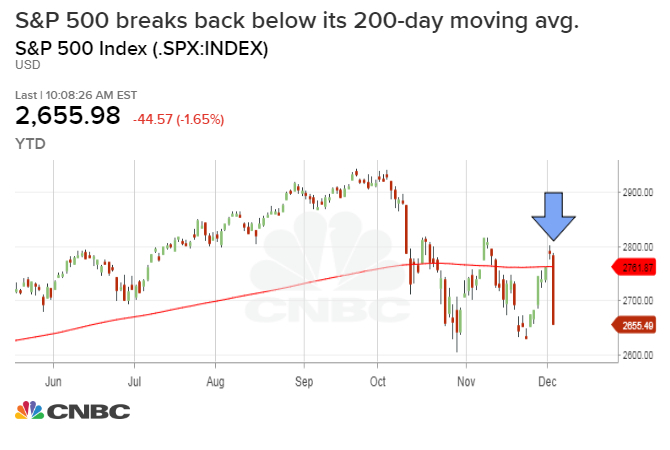 Selling accelerated during the day, after the S&P 500 broke below its 200-day moving average, a key technical measure of long-term trends. Trading this week was halted on Wednesday for a national day of mourning for President George H.W. Bush. Major stock and bond markets were closed for the day and traders said that pause may have added to the tension seen early in trading on Thursday as investors anxiously dumped more of their positions. Then, Canada's Department of Justice announced on Wednesday it had arrested Huawei's global chief financial officer, Meng Wanzhou, in Vancouver. The arrest is reportedly related to Huawei alleged violations of U.S. sanctions on Iran. Meng faces extradition to the U.S.. The arrest was made Saturday — the day of the Trump-Xi dinner agreement — at the request of U.S. authorities. Meng's arrest came as a shock to Beijing. It could hit the global technology supply chain hard, as Huawei is the world's second largest maker of smartphones. Additionally, the detention is the latest blow to the "trade truce." 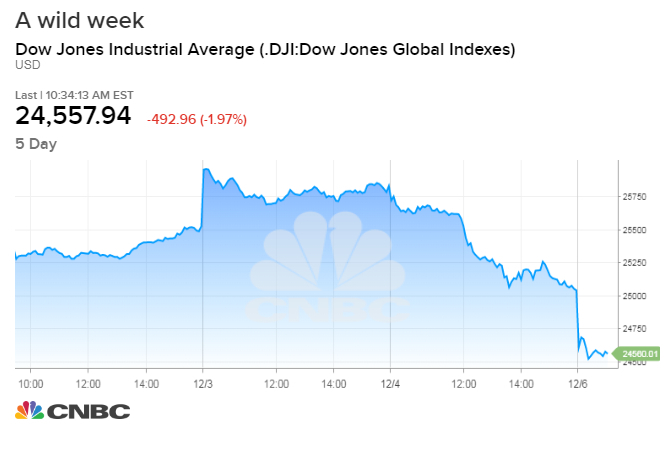 The Dow Jones Industrial Average closed down about 80 points on Thursday, after plunging nearly 800 points during the day. 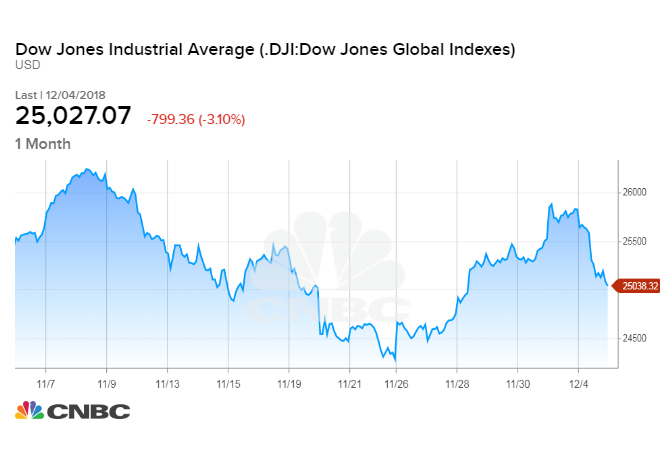 The Dow sank through much of the last two months before a rally in the last week of November brought the benchmark index just barely in the green for the year. The Labor Department's closely watched monthly jobs report is being released Friday morning and could add to or ease the jitters. Economists are expecting to hear that 195,000 new jobs had been created in November and that the unemployment rate had held at 3.7 percent. Also looming is the Federal Reserve's announcement on Dec. 19 about whether it will raise interest rates.